The Bible alerts us to Satan’s subtle deceptions. How aware are we that we have an enemy whose main purpose is to weaken our faith and ultimately destroy us? There are serious warnings in the Bible about Satan’s evil intentions and the many subtle devices he employs to lead people astray. “Sober” implies mentally alert and self-controlled. “Vigilant” means watchful, awake and alert. Even though we understand that God is all-powerful and cares for His children, we cannot afford to relax our guard spiritually. It is vital that we recognize that Satan is relentless and wants to destroy us. We have to be faithful in doing our part. “Walks about” conveys the idea of Satan’s constant state of activity. “Steadfast.” This is translated from a Greek military term signifying standing firm without moving even under an attack from the enemy. For true Christians, we stand fast “in the faith,” because we have faith and confidence in the One who is “greater than he who is in the world” (1 John 4:4). God is vastly more powerful than anything He created, including Lucifer (who became Satan). The Greek word for “faith” here is pistis, which means persuasion, conviction, as well as a reliance on Christ. When used as “the faith,” it can also describe a belief system and have a strong conviction about God’s words, as Colossians 1:23 points out. Military professionals know that soldiers become more adept at resisting the enemy when the frequency of attacks they encounter increases, and experienced troops are referred to as battle-hardened soldiers. With every attack from our adversary, we are strengthening our spiritual resolve to remain steadfast. What’s more, our Heavenly Father cares for us and is watching over us even during our spiritual battles and severe trials. In a similar manner, God is refining and strengthening true Christians. Trials are a part of the Christian experience and should not cause our faith to waver or weaken. With every attack from our adversary, we are strengthening our spiritual resolve to remain steadfast. What’s more, our Heavenly Father cares for us and is watching over us even during our spiritual battles and severe trials (1 Peter 5:7). We oppose Satan’s attacks by standing up to him. We cannot panic or take flight, but rather should offer firm resistance. We must not allow him to get the better of us, no matter what the consequences may be (Revelation 12:10-11). Peter compared Satan to a lion, so what can we learn from this analogy? Rangers who have studied them in the wild will tell you never to turn your back and run from a charging lion. Lions are accustomed to their victims fleeing, but standing firm and facing them bewilders and confuses them. In most case,s the charging lion will stop short and turn away. The advice the apostle Peter gave to Christians on how to contend with and overcome Satan is well worth considering and applying in our daily lives: “Resist him [the devil], steadfast in the faith” (1 Peter 5:9). “Resist” means to stand up to him and be firm. 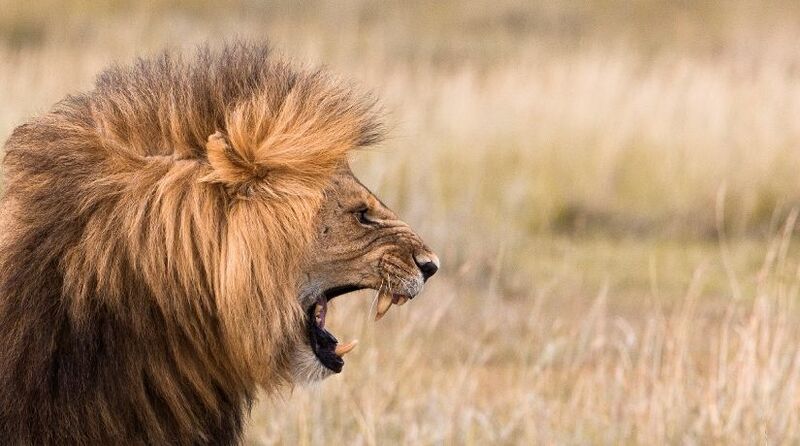 Our response should not be panic, fear and flight, but a firm resistance through the faith of Christ in us—like facing an angry, charging lion in the wild! Lions spend most of the day relaxing and sleeping, storing up their energy for the time they go hunting. Humans should learn a lesson from this behavior. We are admonished in Ephesians 6:12: “For we do not wrestle against flesh and blood, but against principalities, against powers, against the rulers of the darkness of this age, against spiritual hosts of wickedness in the heavenly places”. It is tragic that humans frequently expend their energy and resources fighting each other and forget who the real enemy is. This is one way the devil manages to destroy humans physically, mentally and emotionally. We forget that our most insidious and treacherous enemies are Satan and his demons, who are the unseen rulers of this world. The Christian life requires that we fight “the good fight,” finish the race and keep the faith in order to receive “the crown of righteousness” that God has promised to those “who have loved His appearing” (2 Timothy 4:7-8). Part of finishing the race and receiving the crown of righteousness is standing firm and steadfastly facing our enemy, Satan the devil. It’s a fight well worth fighting, and one we cannot afford to lose!